Thanks to Stephen 'Tag' Loomis (N0TTL) for submitting news about his new plugin called 'CalicoCAT' which is a serial CAT control plugin for SDR#. The plugin emulates the Kenwood TS-2000 CAT control command set, and is used to allow SDR# to communicate with other software running on the PC via a virtual serial port. To create a virtual serial port you can use free software like com0com. Stephen notes that the plugin could be used to allow software like WSJT-X to control SDR#. For example you could use it to automatically change bands at certain times. Last week we posted about the release of a new TETRA decoder plugin for SDR#. The plugin made setting up a TETRA decoder significantly easier compared to previous methods, but it still required the installation and use of the MSYS2 environment on Windows. Thanks to reader Zlati for letting us know that the TETRA plugin has recently been updated once again and now no longer requires MSYS2 to be installed first. Now it is as easy to install as any other plugin, just drop the .dlls into the SDR# folder and add the magicline to the plugins.xml file. We tested it out and decoding worked fine. At the moment the "Net info" button is not working however. Recently Eddie MacDonald has been pumping out simple but useful plugins for SDR# including the SDR# Dark Mode and Visual Tuner Knob plugins. Recently he released a new plugin called "FFT Window Screen Grabber". This plugin simply helps you to easily take a screenshot of the FFT and waterfall displays in SDR#. It could be a useful plugin if you are constantly finding interesting signals that you want to document, or upload to sigidwiki.com. The plugin can be downloaded from his thread in our forums. Note: Updated plugins now available at https://sdrplugins.com. Back in 2016 cURLy bOi released a Windows port of the Linux based "Telive" TETRA decoder. Now the latest development in TETRA decoders is that a TETRA decoder plugin for the SDR# software has been released. This makes setting up a TETRA decoder significantly simpler than before. The plugin doesn't seem to be officially released anywhere, but we did find it thanks to @aborgnino's tweets on Twitter, and he found it on a Russian language radio scanner forum. The plugin is available as a direct download zip from here, but we suggest browsing to the last few posts in the forum thread to find the latest version. Installing the plugin is a little more difficult that usual, as you first need to install MSYS2 which is a compatibility layer for Linux programs. The full installation instructions are included in the README.TXT in the zip file. One clarification from us: you need to copy the files in the msys_root/usr/bin folder from the zip file into the /usr/bin folder that is in your MSYS2 installation directory. We tested the plugin and found it to work well without any problems. With the plugin turned on you just need to simply tune to a TETRA signal in WFM mode, and you will instantly be decoding the audio. TETRA is a type of digital voice and trunked radio communications system that stands for “Terrestrial Trunked Radio”. It is used heavily in many parts of the world, except for the USA. If you have unencrypted TETRA signals available in your area then you can listen in on them with an appropriate SDR like an RTL-SDR and decoder software like the aforementioned plugin. 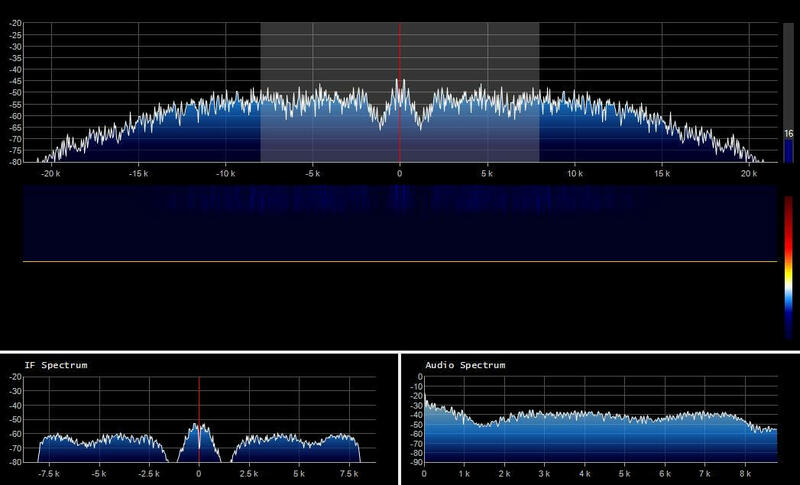 The old audio waterfall plugin for SDR# seems to be no longer available for download anywhere (it may have gone out of date and is no longer compatible with the latest versions of SDR#). Alan Duffy decided to write his own version of the audio waterfall plugin and make it available for download. An audio waterfall shows the demodulated audio in waterfall form, essentially creating an audio spectrum analyzer. This can be useful for understanding the demodulated frequency structure of a signal. Alan's Audio waterfall shown together with the built in audio spectrum analyzer in SDR#. Over on YouTube user FMDX HUN (Luc1f3rk0) has uploaded a video showing how useful the SDR# IF Processor and Notch Filter Plugin can be when attempting to DX FM broadcast stations. He shows that it can be used to listen to stations that are almost overlapping by cutting out the unwanted signal. The plugin itself can be downloaded from http://rtl-sdr.ru/page/para-novyh-plaginov.